---------------------------- With its beige carpet, ornate floral arrangements, and dark wood contours, the dress-shirt section of this ye olde men's store in New York City feels like an old-money country-club locker room (only minus the naked old guys). Cubbyholes filled with crisply folded dress shirts line the walls underneath discreet placards bearing Italianate names. There are few white shirts here, but they are rare air, a moment of silence, among the bold patterns and Dixie Cup pastels. "Nearly impossible," says Matt, a cubicle dweller of 27, of his quest to find the right white dress shirt. He's looked around here and there, tried on contenders, but over and over again he's been let down by fabric too thin or thick, flimsy buttons, blousy fits given to billowing, and collars so big he looks like Tony Montana. This store's best sellers, with their modified spreads and wide-open angles, are the type seen mostly at steakhouses and on trading floors. When the shirt is tucked into a pair of jeans, which is how he'll most likely wear it, its formality seems a little bit silly, like the top of him is at the law firm but the bottom half has been laid off. "I need a white dress shirt," says Matt, "that isn't so dressy." 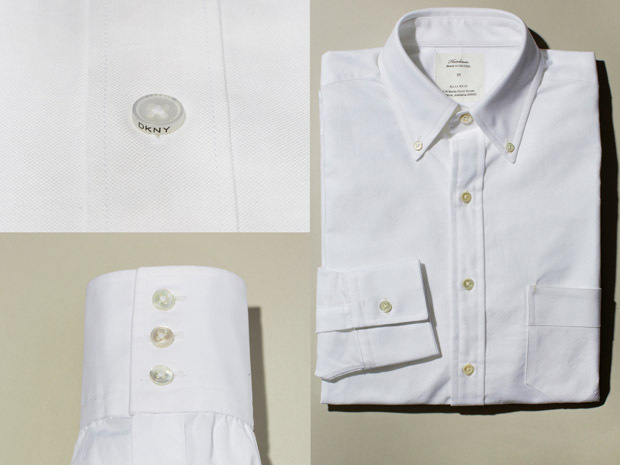 The white dress shirt has been the strong silent type of our collective closet, holding the men who wear it to a rigor patterned shirts might not. Foreboding, it brooks no wrinkles, masks no stains.